Dilip Mahato, is the winner of the prestigious Ustad Bismillah Khan Yuva Puraskar, 2013 from the Sangeet Natak Akademi, New Delhi. This award is awarded every year to young, outstanding practitioners in the field of performing arts - both classical and folk genres. He learnt his art from his father, Jagru Mahato, who had travelled the world in the early days of the `discovery` of Purulia Chho (by Asutosh Bhattacharya) in the sixties. Dilip too has travelled widely around the country and to Germany, Switzerland, Bulgaria, Turkey and Dubai - at the invitation of both state and national cultural bodies. 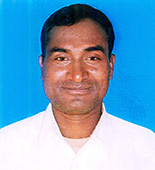 He has also recently taken over the reins of the Chho group started by his father, Binapani Rupchand Chho Nrittyo Party.